I like beige. I like taupe. I like brown. I like simple. And it’s one of the things Jeff and I do not agree on. He likes a little more color. I don’t know why I resisted adding some color for so long. He was right in insisting. Of course. These little additions of color have made the rooms warmer, more interesting. But most of all, they have lifted my spirits. I LIKE walking into the rooms and seeing the subtle transformation. It makes me smile, and chases the funk away that I’ve been in. Don’t worry, I fully plan on divulging the reason for my funk. ©2008 Seven Clown Circus. All Rights Reserved. I loved the added color. I’m a big color person. I’m with Moziesme, your house is spotless. Beautiful color schemes! This is why I look forward to actually owning our own home…so I can add personal touches like paint on the walls. I really like the changes. Sorry, but I agree with your hubby in wanting more color in a home. You have a beautiful house and I have to admit (I have bathroom envy. 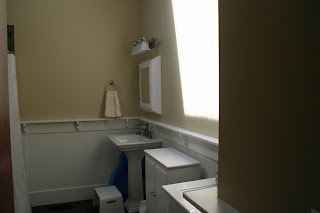 Your bathroom is soo pretty.) Thanks for sharing the photos! Your house is beautiful! Thanks for sharing the pictures. It looked great before, but I do LOVE the colors added. I’m a taupy, chocolate brown, beige and white girl myself–and I recently added some RED pillows to my visual terrain as well–Great Minds Think (and accessorize) Alike, huh? He WAS right! I also like rooms to create a visual pathway, I don’t care for abrupt changes. The little sparks of color make it interesting and then you can pick one of those colors and integrate it into the next room. Of course, then you’d eventually end up with the same so never mind! Your house is so beautiful I don’t believe children live there. And if they do, they are not allowed in any of the rooms shown. If you want to come over and taupe my whole house, as long as you make it look like yours I won’t care! I love your splashes of color. I also like a more natural palette on my walls/furniture but like to add color the way you have. 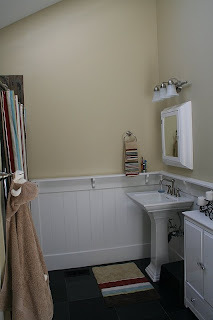 I absolutely LOVE your bathroom!!! I’m the same way. I add color with things that can easily be changed when I get bored with them or when the “new” color comes out. In my girls’ rooms, we did the same. Pretty simple bedding but wild prints, pillows, etc. And I LOVE them both. It’s amazing what a little color can do. Sorry to hear your in a funk…what’s up? I love the new splashes of color! 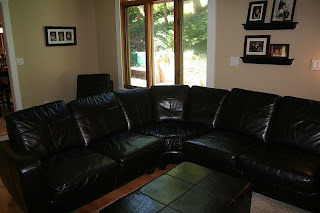 Our house is very beige/chocolate as well, but we have a ton of red thrown in the mix. I think I am ready for a totally different color scheme though. I am on pin and needles to hear about the funk. I hope you are feeling better! We have had the funk around here too, and it is hanging on…fighting tooth and nail. Perhaps another story. Love the added color. Everything look so classy. I love the extra color. Very pretty. 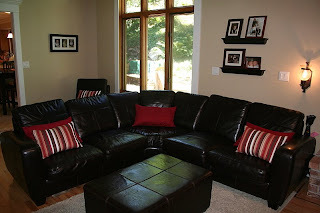 Especially the red pillows on the sectional! The color is totally rad! Love it. Really want to know what’s up with the funk. Tomorrow? You’re killin’ me! Ah, we’re the same way in my house. Everything is neutral in our house it seems except our bedroom which has animal prints. But I think a splash of color against mostly neutral is so beautiful. 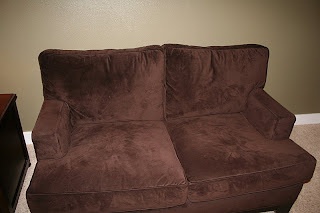 What a difference the pillows make on that couch!!!!!!! Your new color additions look GREAT! And the best part about little changes and pops of color (i.e. 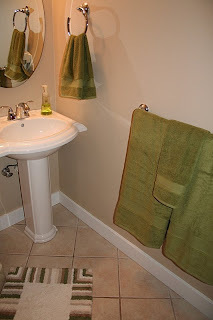 the towels and throw pillows)… when you get sick of that burst of color you can move onto the next!! p.s. wanna come live in and decorate my house?! Yes, the added elements are great! it looks great! i always resist adding color too, but you can really see what a difference it makes in the mood of the room with the pictures you posted. i am sorry you have been in such a funk lately…i hope everything is ok! Fantastic changes! 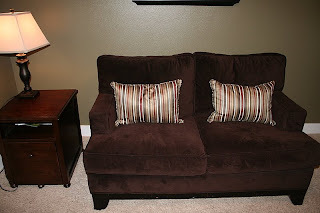 It’s amazing what a difference something as small as a throw pillow can make. Your house is gorgeous, Angie! Please tell me your house looks chaotic some of the time! You have 5 kids….With my 3, I can’t keep up! Probably because I’m blogging all the time. Wow, your house looks awesome! I love the added color, too! Those little bursts of color really do make a difference. I am wondering if we have the same designer (in my case, the standard paint that came with the house and my own earth tone furniture and decorations)? I like what a little color can do and I am going to have to follow you lead. The added color is nice. And your house looks very clean. lol. Thanks for the well wishes today. Have a great day. feel free to come & decorate my house – bring your husband. I also like some color. right now, if I can see the floor – that's good enough for me. yes hopefully you can get the funk out…. decorating is a good dose of cheer. I like the changes. However, I hope Brian is a little pushy in that area too. I tend to stay on the safe side and sometimes just a little change can make a big difference. It looks great. Is your house always that clean? If so good for you! If I had a dirty house AND 5 kids underfoot I’d be certifiably insane. So, yes, I always keep my house clean. For my own sanity. I don’t mind messes in other peoples houses, just not mine. Control freak speaks. Oh, and the FUNK is GONE. ♥ I really like the color too! Everything looks great! Yep, the color pops! It looks like you two balance each other nicely! way to go adding color. and a little pizazz! the stripes are DARLING! totally cute additions. can’t wait to hear what is causing the funk. hope it passes soon. I’m ready to move in! Looks great Angie! I think the clean freak definately comes from the Williams side. This is a topic that Colleen and I recently discussed. Your house really does look beautiful! Move over Martha Stewart…look out for Jeff. Can he come decorate my house? But, that would probably mean I would have to clean first so forget that. Looks fabulous! Very nice subtle color. I like it lots. I tagged you. Check out my blog if interested. Love the color! When you get done with your house any chance of you coming to mine? I am in need of complete redo. I can’t wait to have our very first furniture shop where I get to get the funiture I’ve always wanted. Wow, the little touches of color really add something wonderful! You have a very lovely home. Your house is beautiful. I like the color. I too like splashes of color..always lifts my spirits too to see this one pillow I have on my couch..or the painting over my bed in my bedroom. Hope all is well and that the “funk” lifts soon. I wish I could be subtle like that. My house is an explosion of color. I’m just a color addict. Hope everything’s ok. I’ll be here to check in tomorrow. Angie, that’s a VERY little bit of color. 3 pillows and a few towels? Boy, you are a neutral person. Wait a minute, don’t you have a red room somewhere in that house? Wow, that’s a lot of comments! Great colorful touches and I love that it was your hubby that insisted. I am a beige, taupe, boring person when it come to decorating too so I sympathize. ITs not that I don’t like color, quite the contrary, I am just afraid of it I think. You and your husband are like my sister and me. Our Mom referred to us as the "neutral" and the "color". My sister has exquisite taste, but only if everything is in shades of beige. I have more common taste and I like COLOR – lots of it. My living room is burgundy, my kitchen is apple green & white, and my bedroom is a soft leafy green and cream. Go ahead, try even a little more color – you'll like it! Cool. I LOVE color though. ORANGE in my great room, Navy-ish in my entry. And Raspberry Chocolate in my master bedroom! I don’t think I ever understood real hapiness till I painted my kitchen orange :)! Color just has that effect! You’ve done a great job adding it—in a way that it makes a statement, but can be changed around easily. I love it!!!! We’ve gone from all whites, to bright colors to somewhere in the middle. Colors are tough, but I really like what you’ve done! The added color looks wonderful! I’m glad you gave in and did it. I love the before and after photos. It is amazing what a little color can do! I love the accents. Your house looks beautiful. Even though I’m a neutral (by neutral I mean white) type person I love how the splashes of color add so much. If my house was that clean for just one day, I would feel fantastic! Beautiful! By the way, I tagged ya! Come on over for a visit!